Almost every woman suffers from spider veins and other leg blemishes. In the past, the only way to fight them was through expensive, painful surgery. Thankfully, there are now herbal supplements you can take that may support circulatory health and reduce the appearance of spider veins! Using Veinity Rx is as simple as swallowing two (2) capsules each day. Take one with breakfast and the other with dinner. If you want to see the best results, you should continue taking Veinity Rx for at least three months without interruption. Diosmin is a botanical substance which may improve circulation and reduce the appearance of spider veins. Hesperidin is known as a “bioflavonoid” which is abundant in citrus fruits. It is believed to support vascular health. This botanical extract is harvested from the bark and leaves of the Horse Chestnut tree. Many say it is effective at improving circulation. It may have a funny name, but this natural ingredient may also promote vascular health and reduce the appearance of spider veins. Sitting, standing, walking, and aging in general all contribute to the development of spider veins. This can even sometimes be accompanied by pain, discomfort, itching, heaviness and fatigue. 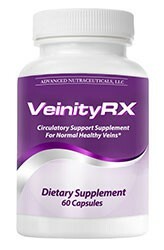 Veinity Rx may improve vascular and circulatory health to provide relief for those who suffer with these issues.